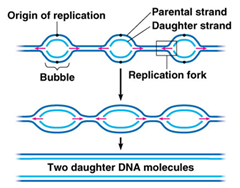 It is now well established that DNA Replication occurs semi conservatively, copying each strand of DNA separately, to produce two new DNA double helices. Each is composed of an old(Parent) strand and a newly synthesized one. Meselson and Stahl in 1958 and J.Cairns in 1963 experimentally verified that the DNA of E.coli replicates semi conservative manner. J.H.Taylor confirmed semi conservative replication of DNA in Vicia faba chromosomes in 1963.